Le Monde reports the four-time champion has been blocked from competing in this year’s race, which starts on Saturday. 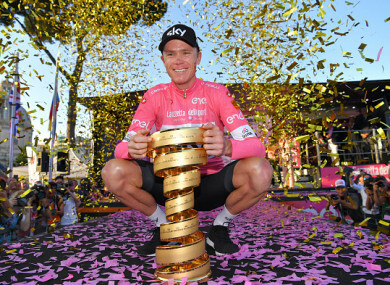 Froome won the Giro d'Italia earlier this year. TOUR DE FRANCE organisers have formally blocked four-time champion Chris Froome from competing in this year’s race, Le Monde reported on Sunday, but he is expected to fight the move. The Team Sky star has been under a cloud since he was found to have twice the permissible amount of asthma drug Salbutamol in his system during September’s Vuelta a Espana, which he won. Five-time Tour winner Bernard Hinault, who worked for the Tour organisation for many years, called for the peloton to strike if the British rider lines up at the start of this year’s event next Saturday. Froome responded on Wednesday that he will compete in this year’s race. A final decision on the organisers’ attempt to prevent the Kenyan-born Briton from taking part is expected to be made by the French National Olympic and Sports Committee, which is to make a ruling on Tuesday, Le Monde said after the last-ditch bid to exclude him. Technically, while Froome awaits the result of an ongoing investigation into his Salbutamol case, he can still ride on the Tour. ASO, the organisers of the iconic Tour, refused to comment on the report although AFP has had confirmation of information they say backs their view that the defending champion should not be allowed to race. According to the letter of the rules, Froome is authorised to ride until a final decision from the anti-doping tribunal of the International Cycling Union regarding his ongoing case. Le Monde says Froome will not necessarily attend Tuesday’s meeting by the French committee with their ruling due Wednesday. He is to be defended by British sports lawyer Mike Morgan, a French speaker, before the UCI tribunal. Email “Chris Froome banned by Tour de France organisers - report ”. Feedback on “Chris Froome banned by Tour de France organisers - report ”.